Healthy entrepreneurs will often exercise first thing in the morning. They are fully aware of how busy their lives are and know that if they don’t make exercise a priority in their lives that it’s likely that something will come between them and their routines at some point during their day. They are also fully aware of how exercise can sharpen the mind and set them up for clarity as well as rev their engines up (kicking their metabolism in) with plenty of energy for their busy day. But, what about you? 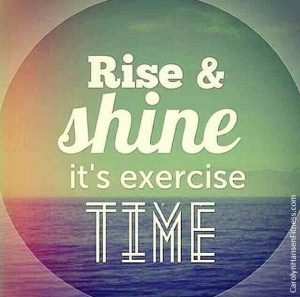 What is your perfect time to exercise? The perfect time for exercise is the “best time for you.” This equation works out differently for everyone because everyone has different preferences. It’s really that simple so don’t over complicate it. We all live different lives and must make that determination for ourselves. The perfect time to exercise is the time that you will do it consistently and based on many factors including: type of activity you choose to do and the location and time of day you are doing it. Some people are tighter on time than others and choose to break up their exercise into shorter increments such as 10 minutes at a time while others choose to get their daily workouts in in one session. Other people are not “morning” people so getting up early in order to get exercise in just doesn’t work for these individuals and in fact, may eventually cause them to give up exercise altogether. Truth is, the time of day can and does influence how you “feel” about exercising because of the body’s circadian rhythm. You are either an early bird or a night owl and only you can determine that by your feelings when exercising. Although many people believe that people who exercise in the morning tend to do better and stick to it longer, the trick is to find what works for you and stick to it – make it a habit. Don’t try and be like “everyone else” or feel as though you must copy what your best friend is doing just because it works for them. But do take your sleep into consideration because you don’t want to sabotage your body’s urge to sleep and exercising too late can do that because it raises your heart rate – not conducive to a good night’s sleep. And, without a good night’s sleep you won’t feel up to par the next day and the likelihood of skipping your workout that day looms big so you really don’t gain anything from it. And, don’t exercise right after eating a meal because your body will use this energy to digest your food rather than sending blood to your muscles. Wait approximately 90 minutes before exercising. Although more is better, any kind of exercise is better than sitting still and leading a sedentary lifestyle. No matter what time of day you choose is best for you the same amount of calories are going to be burned and your body still receives the benefits whether its morning, noon or early evening. Discover the missing strategy that has kept you from reaching the level of success you dream about. “Super Productivity Secrets” is the ultimate lifestyle, fitness and success library. It was written for entrepreneurs ready and willing to operate at full capacity. Discover the missing strategy that has kept you from reaching the level of success you dream about. Entrepreneurs are a special breed of people. They realize that in order to get where they want to be, they will have to make sacrifices along the way…it’s all part of the game. In order to experience the success they seek, they will have to give up things that others simply won’t…this is what separates them from the crowd. Unfortunately many entrepreneurs focus so much on achieving their outer goals that they forget to give their bodies the attention needed. The long hours and hectic pace they keep and the added stress compromises their health but they don’t become aware of it until they find themselves in their 50’s and beyond. Bones take an active role in our health – they are not hard and lifeless as many believe them to be. They are living, growing tissue made up of 3 different components that keep them flexible and strong. Collagen: our bones have a flexible framework because they contain the protein collagen. Living Bone-cells: like other tissue in your body, bone tissue is constantly being replaced with weakened sections removed and replaced with new tissue. You are constantly producing new bone. Peak bone mass – the point at which you have the greatest amount of bone your body will ever have usually occurs sometime between the ages of 18-25. How much bone you have at the moment of “peak bone mass” determines to some degree how likely you will be to break a bone or get osteoporosis later in life. In fact, osteoporosis could be labeled a “young person’s disease” because you can trace its roots back before the age of 36 when the seeds of this insidious disease are sown. Truth is, osteoporosis is not a disease that just strikes little old ladies; it is a silent deadly thief that begins stealing away our bones starting early on in childhood at astonishing rates. Most people are not even aware of the amount of damage occurring in their bodies until the damage is done. Poor lifestyle habits contribute to weakened bones. Nutrient void diets, excessive use of caffeine or alcohol and of course lack of exercise are all major offenders. Family history plays a role as well as certain diseases related to organs such as the liver or kidneys and others. Even repetitive use of medications can contribute to bone loss but the biggest contributor is a sedentary, inactive lifestyle. The great news is that osteoporosis is not inevitable or a disease of the elderly, it can be prevented, slowed and even reversed if proper steps are taken now. The younger you start the better. Studies reveal that the loss of muscle and bone strength are not the result of aging but merely the direct result of our inactive lifestyles. Unless we consciously set out to prevent muscle tissue loss, we lose as much as ½ our strength by the time we reach 65 years of age. The greater the muscle tissue loss the higher the incidence of weak, thinning, brittle bones because muscles are attached to bones. When a muscle is contracted against resistance it pulls on the bone, and this type of mechanical loading makes the bones grow thicker and gain mass to protect itself while under stress thus leading to stronger bone. Although all forms of exercise have something to offer in regards to contributing to our health, not all of them are suitable and proper when it comes to strengthening bones. Activities such as walking, running, biking or swimming are great recreational activities but do not contribute what’s needed to stress the skeleton properly. 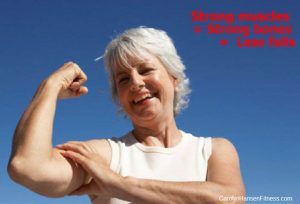 Strength training – some form of resistance training is what grows strong dense bones and strong toned muscles that protect against osteoporosis. Stronger bones and muscles helps improve balanced and coordination resulting in less bone shattering falls. The equation is simple: Incorporating regular challenging strength training exercise throughout adulthood is key to keeping muscles and bones in peak condition. 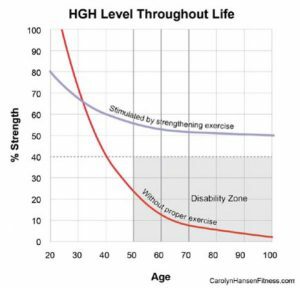 We must pay attention to our muscle strength and bone density now if we want to enjoy our independence and stay “wildly active” not “mildly active” in our lives as we get older. Being strong, healthy and fit are the obvious benefits of working out but they are only secondary benefits. The most important benefit is honing your powers of personal development. The more you immerse yourself in personal development, the more you realize how interconnected all aspects of life are. Living a holistic life with personal fitness as the core (our inner most strength) translates to growth and balance in all areas of our lives – career, relationships, finances and spirituality as well, so it’s not hard to see why exercise is one of the most important activities to integrate into our lifestyle. The body and mind are intimately interconnected and the importance of physical fitness cannot be underestimated – it goes beyond mere physical benefits. Aside from the nearly infinite list of physical health benefits you get by exercising your body, exercise is one of the best ways to do a mental workout too. In fact, the mental aspect is one of the key benefits of physical fitness because the attitude it takes to succeed is the same whatever it is you are trying to achieve and the principles you learn and develop in physical fitness can be used successfully in other areas of your life. Truth is, your brain loves movement and performs better when you are in good shape. The more you exercise – the more you’re able to learn, create, and produce – the more successful you’ll be come. Your confidence and self-esteem get a boost when you’re looking and feeling good and this in turn reflects in your business and personal life. Exercise not only boosts those feel-good endorphin’s and improves moods making us feel relaxed, refreshed, positive, and confident but it also makes us more productive entrepreneurs. 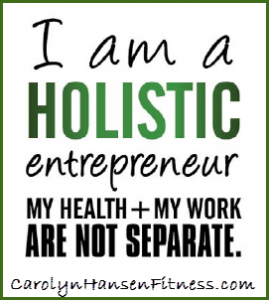 Think of it this way, better health, better business. Studies reveal that those who exercise regularly earn 10 percent more on average than those who don’t exercise regularly how’s that for a sweet benefit? When you are fit and healthy you exhibit certain lifestyle habits along with characteristics and qualities that help shape you to become the absolute best that you can be. If you can succeed at building your fitness level up and taking proper care of your body then it’s likely that most often you’ll succeed in other areas of your life – the things you put your mind to. Discover the missing strategy that has kept you from reaching the level of success you dream about. “Super Productivity Secrets” is the answer you’ve been searching for. It was written for entrepreneurs ready and willing to operate at full capacity. It is the ultimate lifestyle, fitness and success library.